During the reigns of Ramses IV-XI, the country fell more and more under the control of the priests of Amon-Ra. As their power grew, they demanded blind conformity to a system that gave them control and their temples wealth. The demand for gold and workers to mine it, the need for troops for the almost continuous war in Asia, and the independence of the powerful leaders in Nubia and Kush weighed heavily on the state. A power struggle was inevitable. By the reign of Ramses IX there was such disorder that Hrihor, High Priest of Amon, was able to declare himself to be Viceroy of Kush. 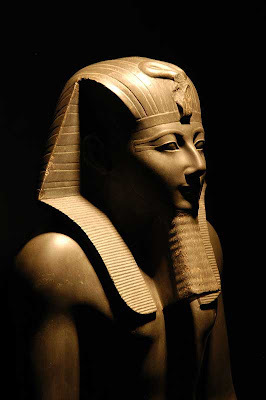 This combination of religious and secular power enabled him (1085 BC) to usurp the throne of the pharaohs. Egypt became a land divided. Lower Egypt was ruled by a Dynasty in Tanis in the Delta. Upper Egypt was ruled by Hrihor. Both kingdoms w'ere so weakened that a powerful Dynasty of Libyan descent was able to take over control of the country. Palestine and Syria were lost. Nubia, where many Upper Egyptians had taken refuge, gained independence. While Egypt was sinking into mediocrity, deep in the heart of Kush a pharaonic style court continued. Though African in origin, it was Egyptian in tradition and belief. 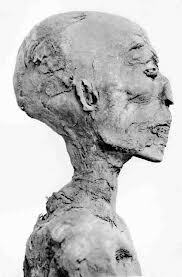 The king bore pharaonic titles, and the cult of Amon-Ra had long been established there. Aware that Egypt was torn by dissention, these proud and vigorous Kushite rulers marched northwards to put an end to the prevailing corruption and re-establish order. Under the Kushite leaders, Egypt enjoyed a period of internal stability. Temples w ere restored and age-old texts were reinscribed. However, their role in Egypt came to an end with the Assyrian conquest, when all Egypt’s great cities, especially Thebes, were mercilessly sacked. After the Assyrians came a short-lived revival, known as the Saite period, followed by the Persian invasions and then the Greek and Roman occupations, when the wonders of ‘Hundred-gated Thebes’ spread throughout the Graeco-Roman world. It is perhaps a measure of the greatness of Thebes that Libyans, Kushites, Greeks and Romans honoured, embellished and adorned the ancient city.